Resort fee: You will be charged a $36.28 resort fee (per room, per night) by the hotel. Includes in-room Wi-Fi for two devices per day at the Premium Wi-Fi speed of 20 mbps, fitness center passes for two per day and all local calls. Resort fee: $36.28 per night payable at hotel. Promotions available: Click “see more” for details. Terms: Hotel blackout dates apply and are subject to change without notice. Minimum 1 night stay required. 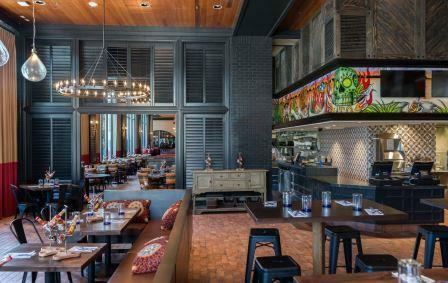 New reservations only; cannot be applied to previously booked rooms. Not valid for group travel. Savings applies to hotel only. This special is not combinable. Offer may be withdrawn at any time. This is how you vacation. 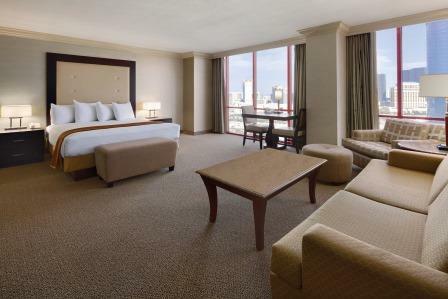 At the Rio All-Suites Hotel and Casino every room is a spacious suite featuring expansive floor-to-ceiling windows showcasing views of Las Vegas. 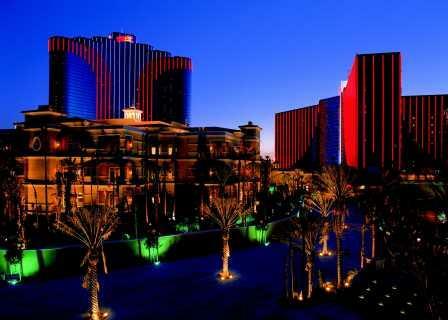 Free self-parking and a convenient location near the Las Vegas Strip make it easy to explore all of Las Vegas. Enjoy worldwide flavors from Asian inspired cuisine to the tastes of India and swimmingly good seafood options at the Carnival World Buffet. 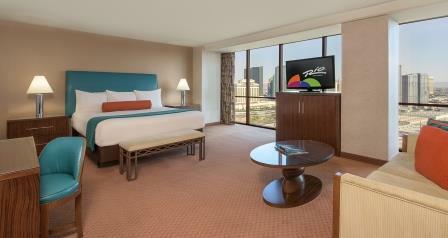 Book your vacation today with a stay in one of these great suites. 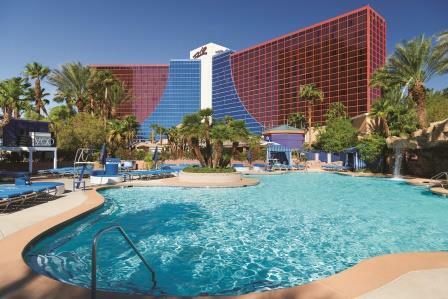 Four different pool areas including Voo Pool, the ultimate adult pool experience. Connects the two towers of the Rio more than 490 feet above the ground for two riders at a time. A 13,000 square-foot themed attraction that showcases an indoor glow-in-the-dark 18-hole miniature golf course. - Penn & Teller: An edgy mix of comedy and magic. - Chippendales: The ultimate Las Vegas girls' night out. - WOW: A water spectacular with more than 30 acrobats and dancers. - Comedy Cellar: The longest-running and most successful comedy club from New York. - The Eddie Griffin Experience: Stand-up comedy in the King's Room, the longest-running and most successful comedy club from New York. - VooDoo Rooftop Nightclub & Lounge: Nightlife destination with live DJ spins nightly, outdoor patio and dance floor and award-winning flair bartenders. - Masquerade Bar: Live music select Thursdays and every Friday and Saturday. • Hotel information: Credit card required at check-in. Rooms for physically challenged available. • Parking: Valet parking ($). • Traveling with children: No child rates available. Cribs available ($).